Graphs & complete article on the website link. Many eyebrows were raised when a little known LEPL group decided to get into aviation. Was it another group eying to get into one of the most difficult markets in the world or is it just the lure of publicity and glamour that is attracting a new player? This was also around the time when the regulator has published a regional airline policy and LEPL group moved in to take advantage of the same by starting an airline in the south. The benefit with being part of the regional policy in South is that it allows the player to operate in the golden triangle of Bengaluru – Hyderabad – Chennai, while going to any other metro is forbidden. The benefit – the industry is shifting focus from metro connectivity to Tier – II connections and a south based regional airline is best placed to take advantage of this policy flying to any other non metro from Bengaluru, Hyderabad or Chennai. Such an airline is also exempted from following the Route Dispersal Guidelines (RDG). Sir, thank you for an interesting analysis. At least from a layperson's perspective, Air Costa seems to be making a couple of hesitant steps, random steps, some brave steps, and some smart ones. Perhaps due to the deep pockets of the LEPL group, they have had enough to sustain them for the time being. 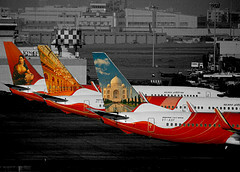 A conservative approach possibly would have been to go in to the AT7s, and serve the Southern markets well, with an established plane type with good economy figures, a common type with two major airlines in India, a type which Mx would be fairly comfortable with, instead of the fuel-thirsty regional jets (as you have mentioned), with larger capacity, but limited markets. As with family-run businesses, it is sometimes a bit difficult to gauge their strategies, both long-term, as well as short-term. I am also not sure if we have access to some basic statistics about how they are doing in terms of passenger numbers, loaf factors, and more importantly, yields. They have had some route planning changes, and some innovative ones as well. Thanks for a nice analysis, Sir! Nice article Ameya - can Air Costa for instance tie up with Vistara - so Air Costa takes on the regional flying ASKMs mandated for Vistara - for a hefty fee? This way Vistara can keep focus on it's mainline trunk market, and Costa can benefit from it's smaller capacity a/c which can be used on long thin routes to meet the requirements of the "Route Dispersal Guidelines"? Yes it can. In the past, SG has purchased ASKMs from 6E and the favor was returned by SG at a later date. IIRC, this was in 2011. The RDG is now hanging on the government policy changes.